Genesis 2:1-3… Thus the heavens and the earth were finished, and all the host of them. And on the seventh day God ended his work which he had made; and he rested on the seventh day from all his work which he had made. And God blessed the seventh day, and sanctified it: because that in it he had rested from all his work which God created and made. And it came to pass, that there went out some of the people on the seventh day for to gather, and they found none. And the LORD said unto Moses, How long refuse ye to keep my commandments and my laws? See, for that the LORD hath given you the sabbath, therefore he giveth you on the sixth day the bread of two days; abide ye every man in his place, let no man go out of his place on the seventh day. Exodus 20:8-11… Remember the sabbath day, to keep it holy. Six days shalt thou labour, and do all thy work: But the seventh day is the sabbath of the LORD thy God: in it thou shalt not do any work, thou, nor thy son, nor thy daughter, thy manservant, nor thy maidservant, nor thy cattle, nor thy stranger that is within thy gates: For in six days the LORD made heaven and earth, the sea, and all that in them is, and rested the seventh day: wherefore the LORD blessed the sabbath day, and hallowed it. God gave the Ten Commandments to Moses on Mount Sinai and set them in stone. Here not only did God bless the Sabbath…He hallowed it. In other words, God set the seventh day apart and sanctified it unto Himself…He made it Holy unto the Lord. Isaiah 66:22-23… For as the new heavens and the new earth, which I will make, shall remain before me, saith the LORD, so shall your seed and your name remain. And it shall come to pass, that from one new moon to another, and from one sabbath to another, shall all flesh come to worship before me, saith the LORD. Revelation 22:14end of the book…..His Words……. Now, I must make known to all, the very fact that the Roman Catholic Church has taken upon itself to change times and laws. In 321 CONstintine changed the TRUE Seventh Day Sabbath (Saturday since creation) to “SUN“-day, the Day of the invincible “SUN (Sol Invictus)”! This was done under Euscebius input. This is automatically causing most of the world to break the Lord’s 4th commandment. The breaking of the law (commandments) is SIN! The wages (cost) of SIN is DEATH! (ETERNAL). This was given during creation BEFORE there were Jews on the Earth! This was given a second and third time to Moses. BE NOT DECEIVED. THIS WILL BE CALLED IN THE END TO BE OBSERVED; just AS Daniel, Shadrach, Meshach and Abednigo. It is “NOT” the mark of the Beast. Justin Martyr, a popular “mainstream Christian “of the second century (around 150 AD) believed that the Sabbath was an outdated mosaic law which God placed on the Jews as ” a mark to single them out for punishment they so well deserve for their infidelities.”- Justin Martyr, Dialogue with Trypho. “This zeal for Saturday-keeping continued for a long time: even little things which might strengthen the practice of keeping Saturday were punished.” – Bishop Anjou, Svenska Kirkans Historia after Motet i Upsala. “The famous Jesuit, Francais Xavier, called for the Inquisition, which was set up in Goa, India, in 560, to check the ‘Jewish wickedness’ (Sabbath-keeping).” – Adney, The Greek and Eastern Churches p 527,528. “Some have suffered torture because they would not rest when others kept Sunday, for they declared it to be the holiday and law of Antichrist.” – Sebastian Frank, AD 1536. 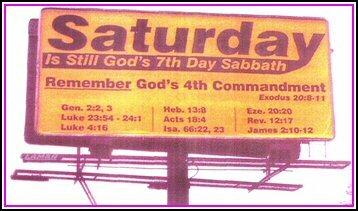 By this time in history the Seventh day Sabbath was severely under attack. Catholic Provincial Council at Bergen -” We are informed that some people in different districts of the kingdom, have adopted and observed Saturday-keeping. It is severely forbidden- in holy church canon- one and all to observe days excepting those which the holy Pope, archbishop, or the bishops command. Saturday-keeping must under no circumstances be permitted hereafter further than the church canon commands. Therefore, we counsel all the friends of God throughout all of Norway who want to be obedient towards the holy church to let this evil of Saturday-keeping alone; and the rest we forbid under penalty of severe church punishment to keep Saturday holy.” – Dip, Norveg, 7, 397. “The inquisitors…(declare) that the sign of a Vaudois (Waldeneses of France, Sabbath keepers) deemed worthy of death, was that he followed Christ and sought to obey the commandments of God” – History of the Inquisition of the Middle Ages, H.C. Lea, Vol 1. “Is not yet too late for Protestants to redeem themselves. Will they do it?… will they indeed take the written word only, the Scripture alone, as their sole authority and their sole standard? Or will they still hold the indefensible, self contradictory, and suicidal doctrine and practice of following the authority of the Catholic church and wear the SIGN of her authority? Will they keep the Sabbath of the Lord, the seventh day, according to Scripture? Or will they keep the Sunday according to the tradition of the Catholic church?